Thanks to generous support from donors, our department gives financial awards to undergraduate and graduate students each year. 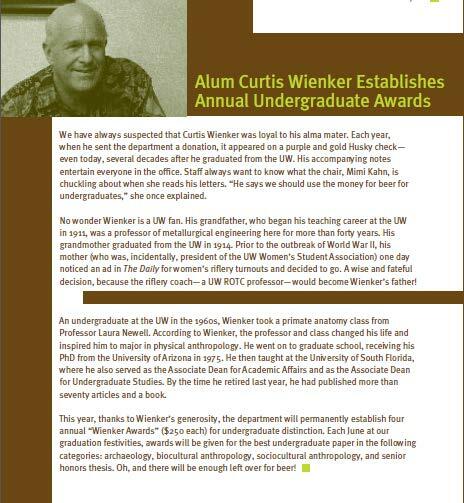 The department permanently established four annual "Wienker Awards" for undergraduate distinction, through the generous donation of department alumnus, Curtis Wienker. Each year we recognize, with financial awards, the Best Undergraduate Honor's Thesis and Best Anthropology Essay - one each for archaeology, biological anthropology, and sociocultural anthropology. A faculty committee selects the papers for each award. Additional support for anthropology undergraduate students comes from the Gerald G. Eck Student Fund, to help with the expenses related to honors program research, and the Senturia Family Fund, to support undergraduate students with financial need, to take part in field schools, study abroad programs, or purchases that make a difference and allow students to complete their studies. The department helps to support pre-dissertation pilot research projects and travel to national academic conferences for graduate students. Pre-dissertation pilot research awards provide graduate students with critical support that is not typically available from any other source of funding. Each year we fund as many graduate students as possible to conduct pre-dissertation pilot research. This research is used to identify a field site, make important connections at the location, and undertake preliminary data collection. These awards are made in amounts ranging from $600 to $1,500 each. This research is funded directly by donations to several department gift accounts. One significant source of support comes from the Student Training in Anthropological Research Tools and Skills (STARTS) endowment fund. In January 2014, the department hosted an event to honor its founders, David Notkin and Cathy Tuttle. (You can read Cathy’s comments here.) To see the many ways in which STARTS has supported graduate student research, the department created a 45-page booklet that highlights 21 of the STARTS recipients with descriptions and photos of their research. Additional support for anthropology graduate students comes from the Evan David James Fellowship to support deserving graduate students conducting research in the pacific northwest, and the Ronald Leroy Olson Fellowship to support either students who are members of a Native American or Native Alaskan Tribe, or those conducting research in the Pacific Northwest. The Brett Baldwin Scholarship is open to both anthropology undergraduate and graduate students, and is awarded on academic merit.